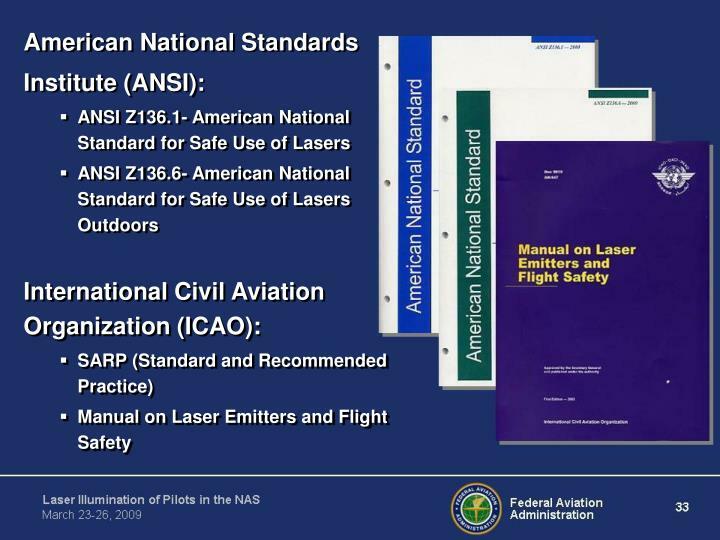 Laser Illumination of Pilots in the National Airspace System What is a Laser? 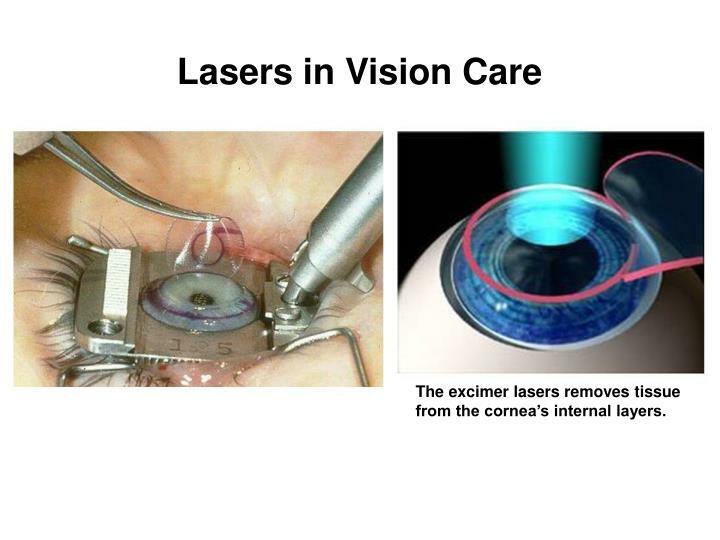 L ight A mplification by the S timulated E mission of R adiation Lasers in Vision Care The excimer lasers removes tissue from the cornea’s internal layers. from the cornea’s internal layers. 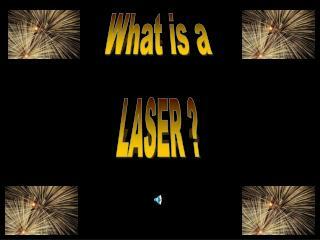 Lasers demonstrations are used to attract and entertain the public at special events, theme parks, and casinos. 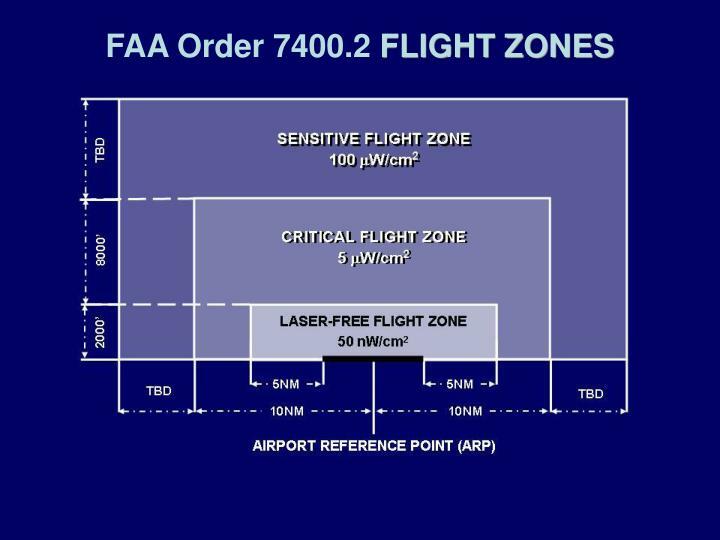 FAA Order 7400.2 Procedures for Handling Airspace Matters, Part 6. 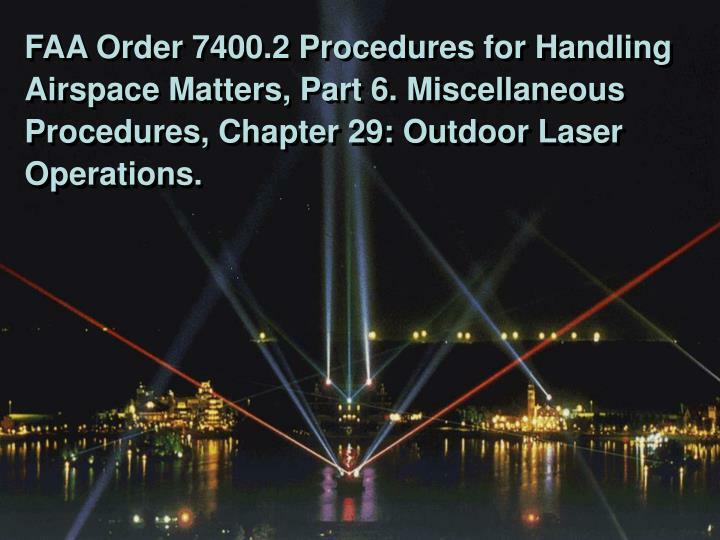 Miscellaneous Procedures, Chapter 29: Outdoor Laser Operations. 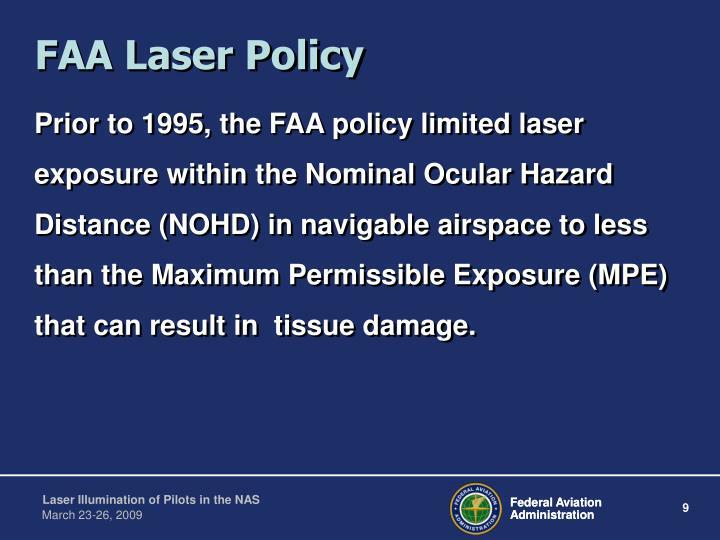 Prior to 1995, the FAA policy limited laser exposure within the Nominal Ocular Hazard Distance (NOHD) in navigable airspace to less than the Maximum Permissible Exposure (MPE) that can result in tissue damage. 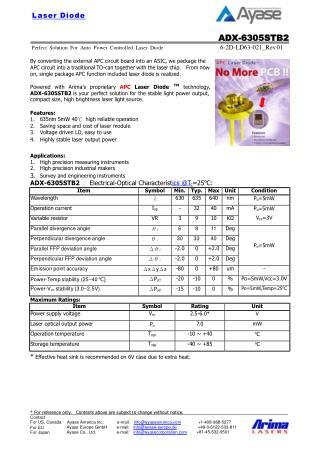 300 - 400 nm: Photochemical UV cataract. 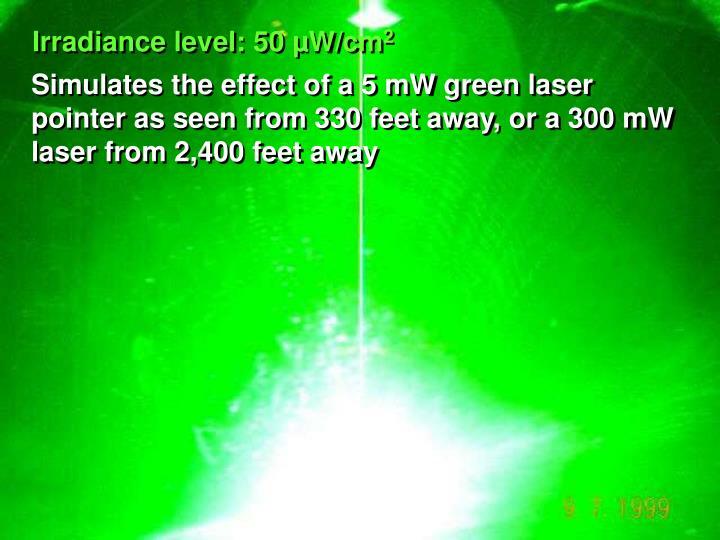 400 - 780 nm: Photochemical and thermal retinal injury. 780 - 1400 nm: Cataract, retinal burns. 1400 - 3000 nm: Corneal burn, IR cataract. 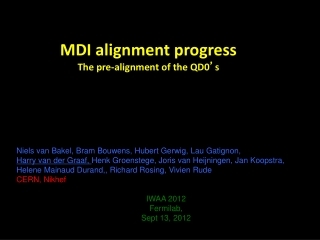 NOTE: Optical gain of the eye is about 105. 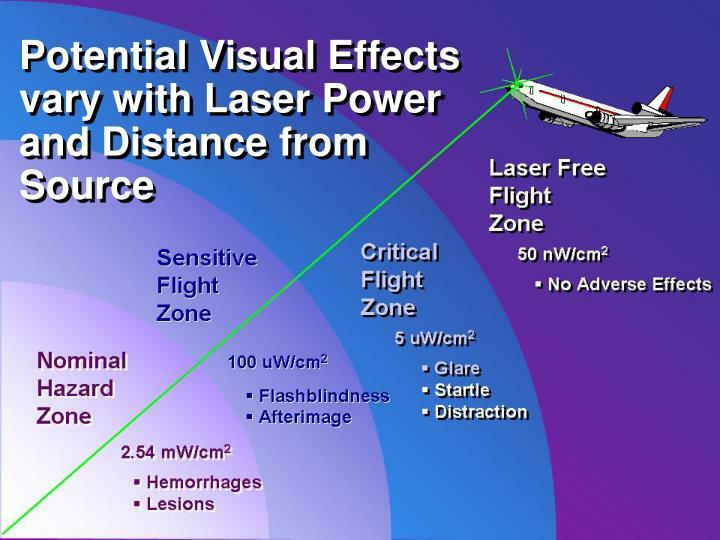 In the retinal hazard region (400 – 1400 nm), irradiance of 1 mW/cm2 entering the eye is increased to 100 W/cm2 at the retina. 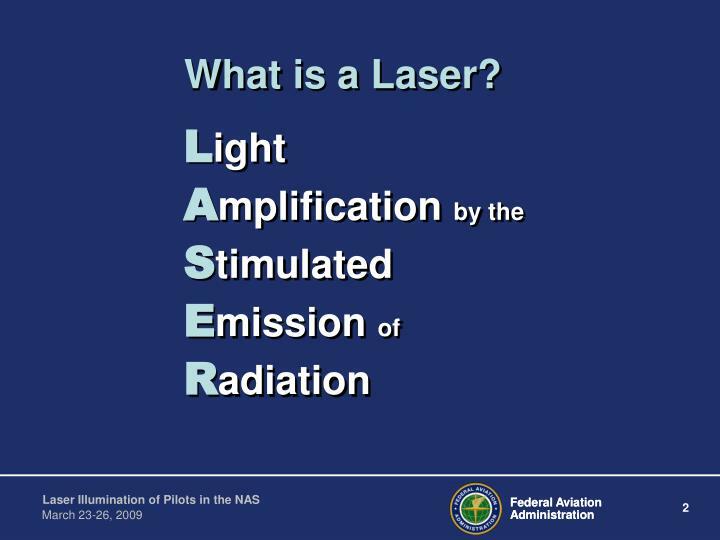 Glare – Obscuration of an object in a person's field of vision due to a bright light source near the same line-of sight (e.g., oncoming car headlights). 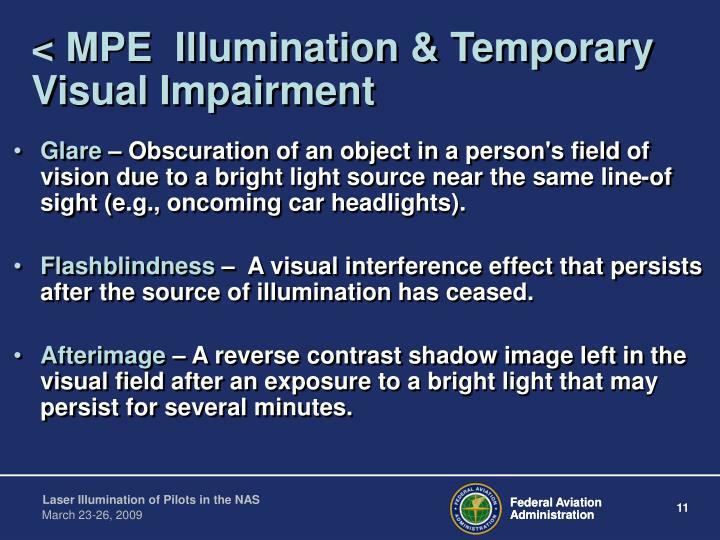 Flashblindness – A visual interference effect that persists after the source of illumination has ceased. Afterimage – A reverse contrast shadow image left in the visual field after an exposure to a bright light that may persist for several minutes. 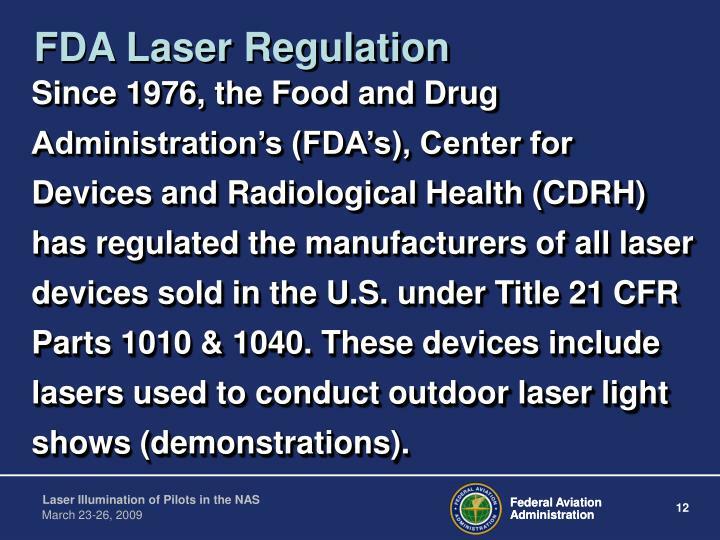 Since 1976, the Food and Drug Administration’s (FDA’s), Center for Devices and Radiological Health (CDRH) has regulated the manufacturers of all laser devices sold in the U.S. under Title 21 CFR Parts 1010 & 1040. 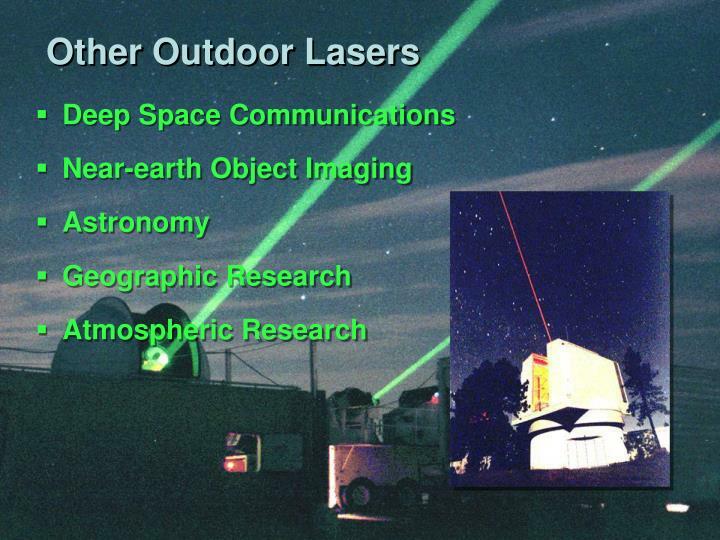 These devices include lasers used to conduct outdoor laser light shows (demonstrations). 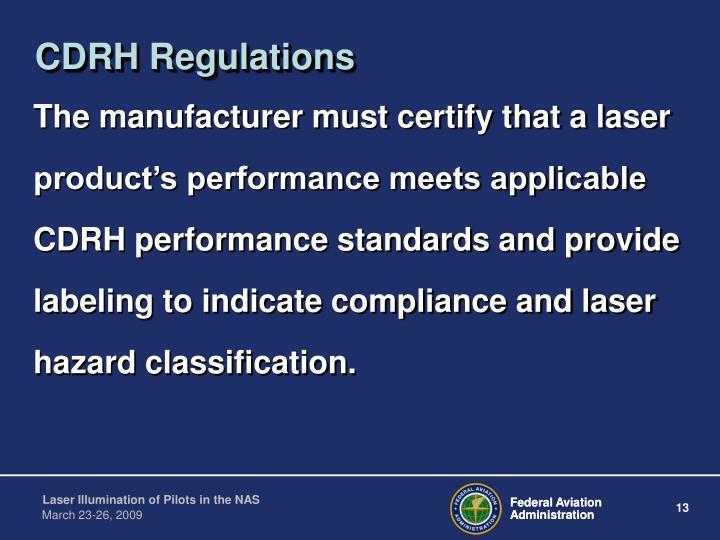 The manufacturer must certify that a laser product’s performance meets applicable CDRH performance standards and provide labeling to indicate compliance and laser hazard classification. 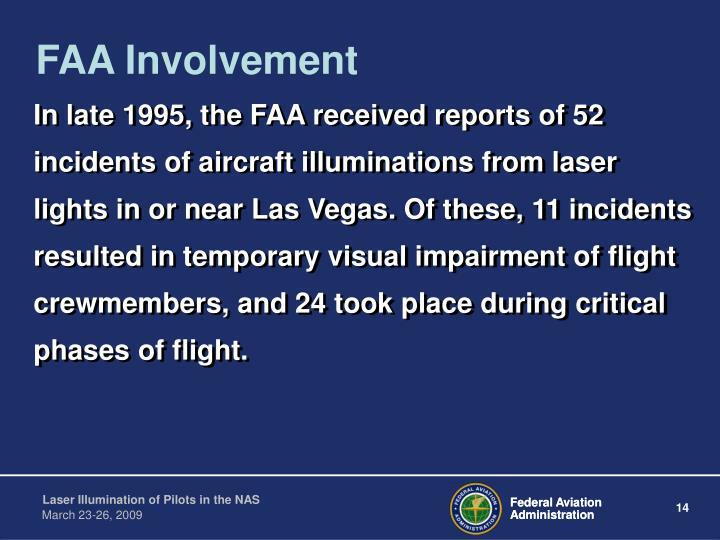 In late 1995, the FAA received reports of 52 incidents of aircraft illuminations from laser lights in or near Las Vegas. 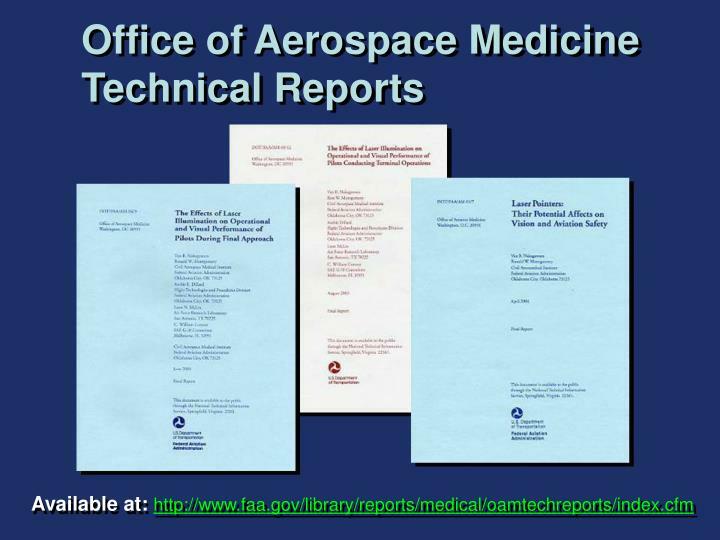 Of these, 11 incidents resulted in temporary visual impairment of flight crewmembers, and 24 took place during critical phases of flight. 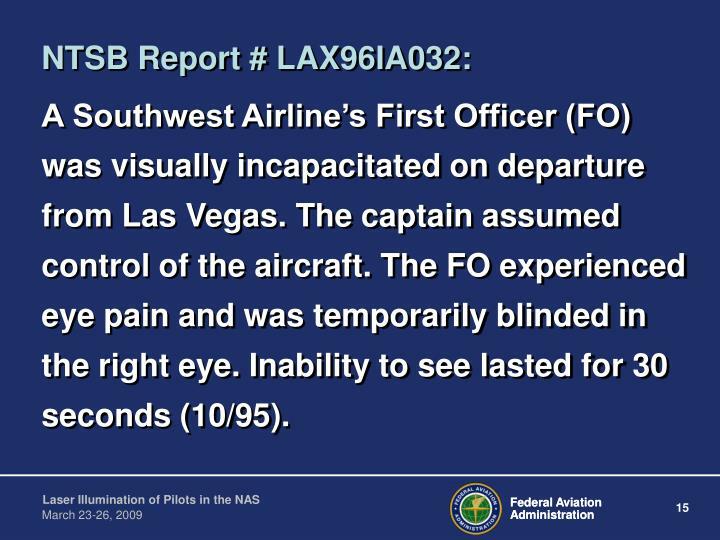 A Southwest Airline’s First Officer (FO) was visually incapacitated on departure from Las Vegas. 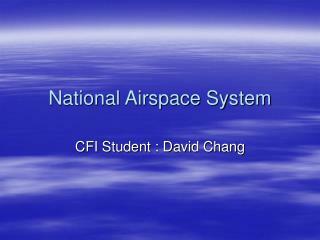 The captain assumed control of the aircraft. 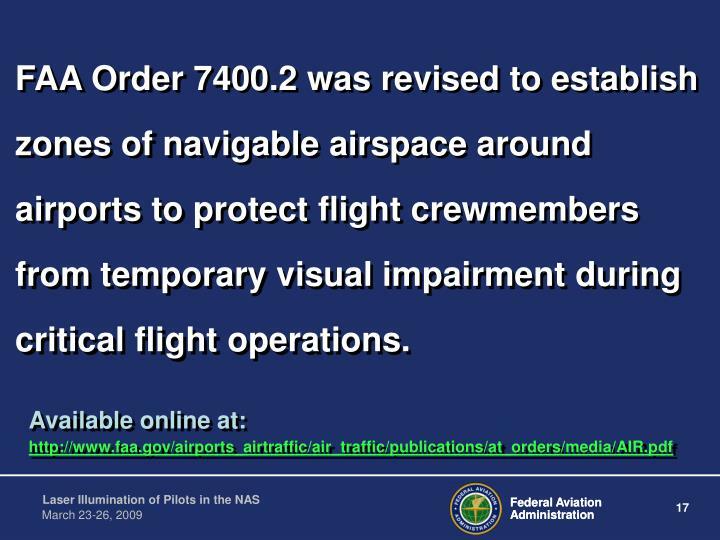 The FO experienced eye pain and was temporarily blinded in the right eye. Inability to see lasted for 30 seconds(10/95). 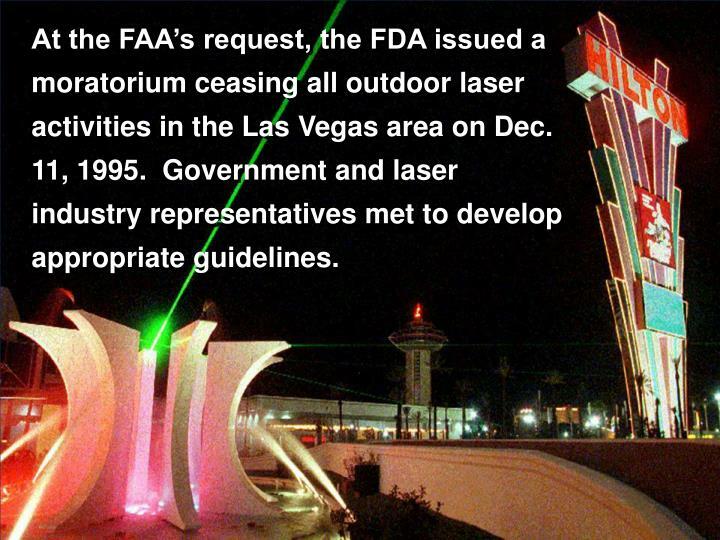 At the FAA’s request, the FDA issued a moratorium ceasing all outdoor laser activities in the Las Vegas area on Dec. 11, 1995. 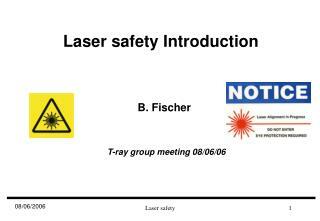 Government and laser industry representatives met to develop appropriate guidelines. 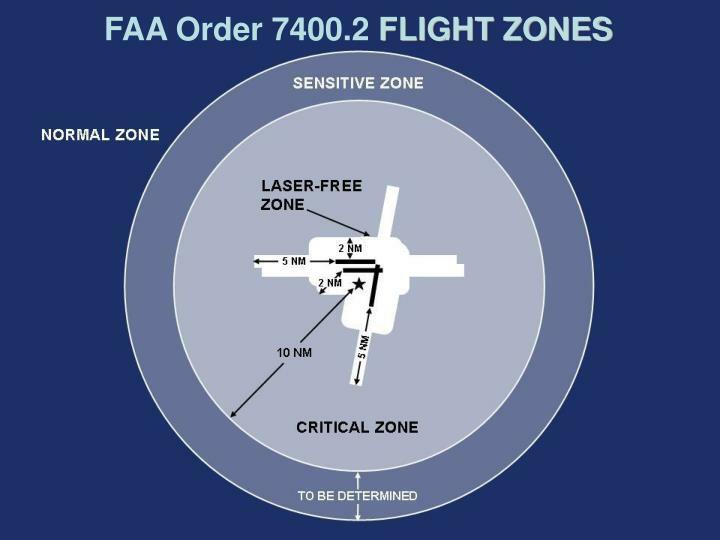 FAA Order 7400.2 was revised to establish zones of navigable airspace around airports to protect flight crewmembers from temporary visual impairment during critical flight operations. 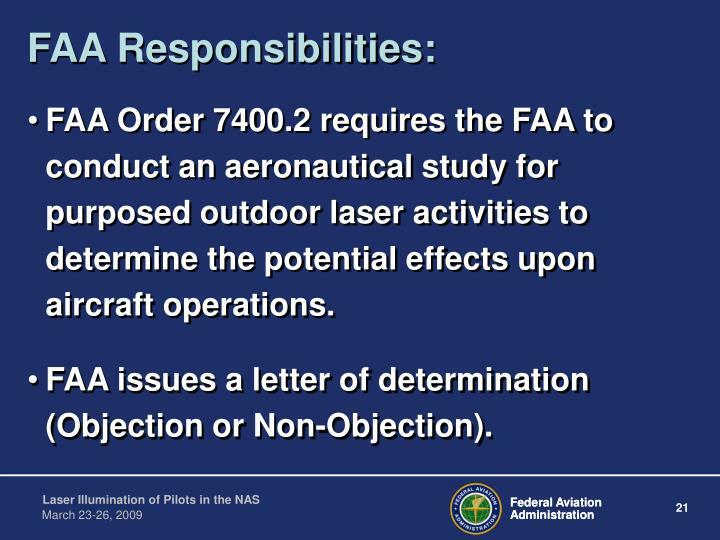 FAA Order 7400.2requires the FAA to conduct an aeronautical study for purposed outdoor laser activities to determine the potential effects upon aircraft operations. 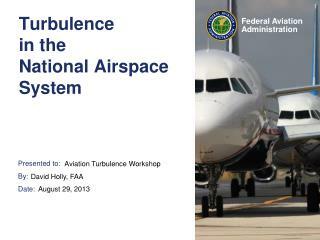 FAA issues a letter of determination (Objection or Non-Objection). 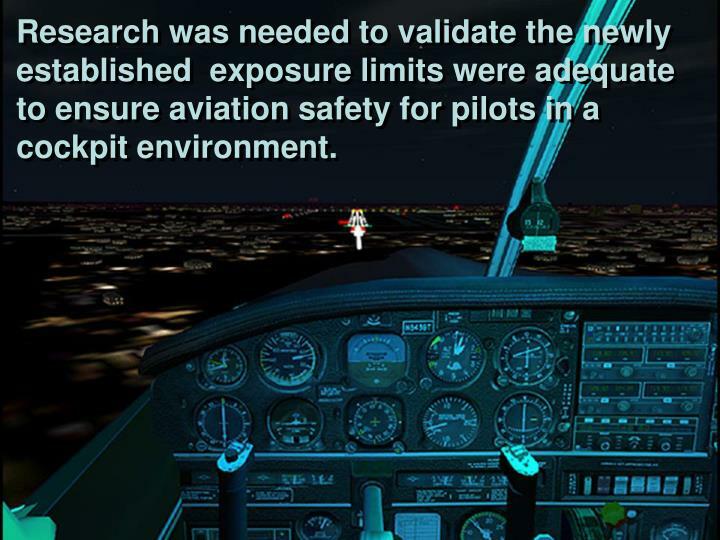 Research was needed to validate the newly established exposure limits were adequate to ensure aviation safety for pilots in a cockpit environment. 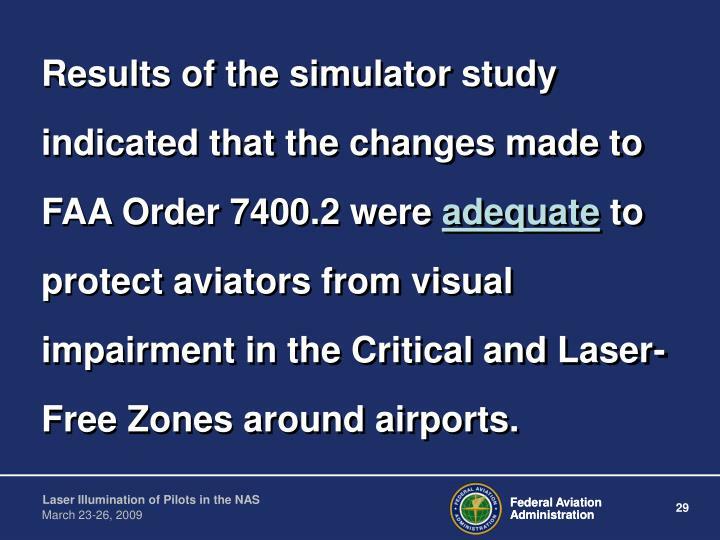 Results of the simulator study indicated that the changes made to FAA Order 7400.2 were adequate to protect aviators from visual impairment in the Critical and Laser-Free Zones around airports. 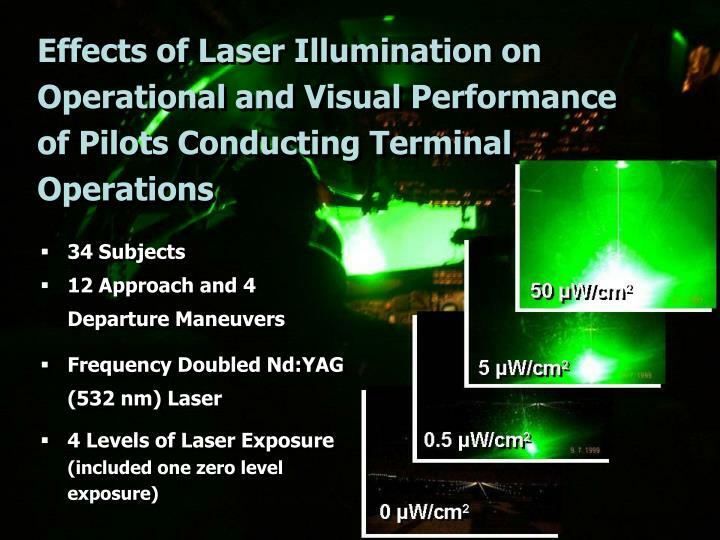 As incidents associated with laser displays declined, the increased availability and popularity of handheld lasers presented an increasing threat to aviators. 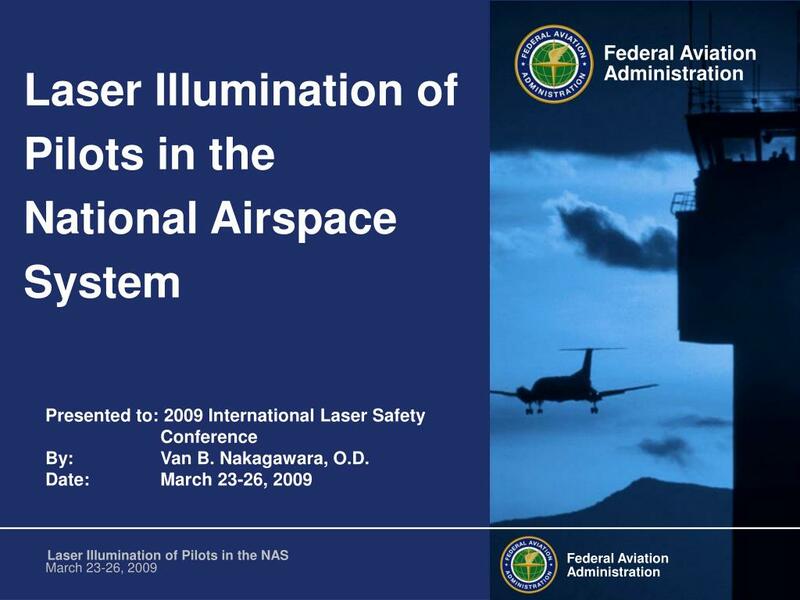 Between 1 January 2004 and 31 January 2005, there were 90 reports of laser illumination. More importantly, 93% occurred in the last 3 months of the study period. 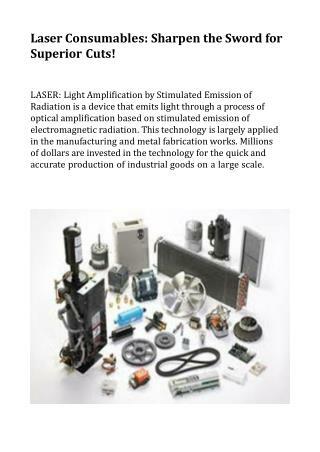 In recent years, more powerful handheld lasers have become affordable. 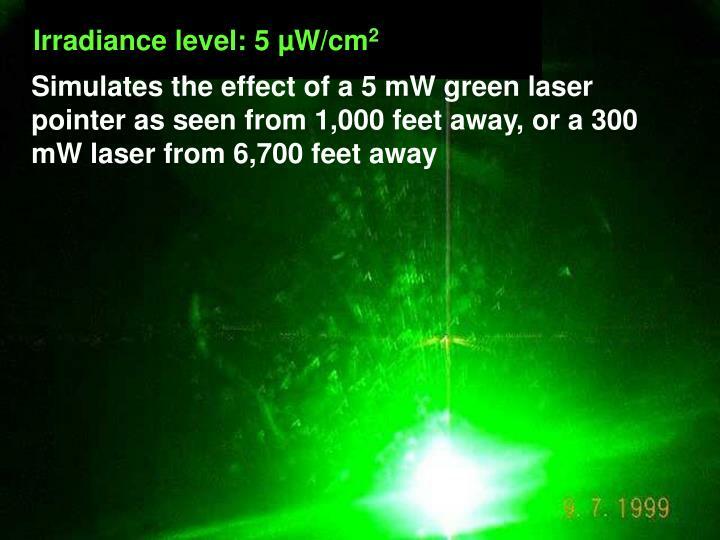 Greenlasers are especially popular because they can appear up to 35 times brighter than some redlaser pointers with similar output power. 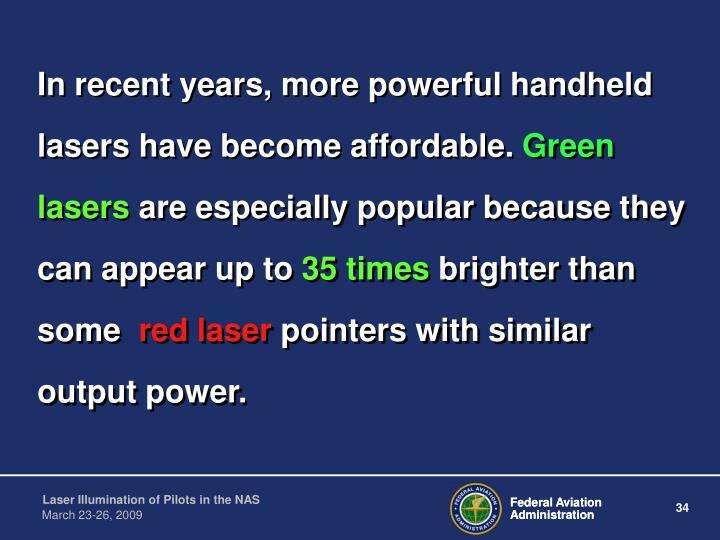 Green laser pointers are now responsible for > 86% of aircraft lazing incidents. 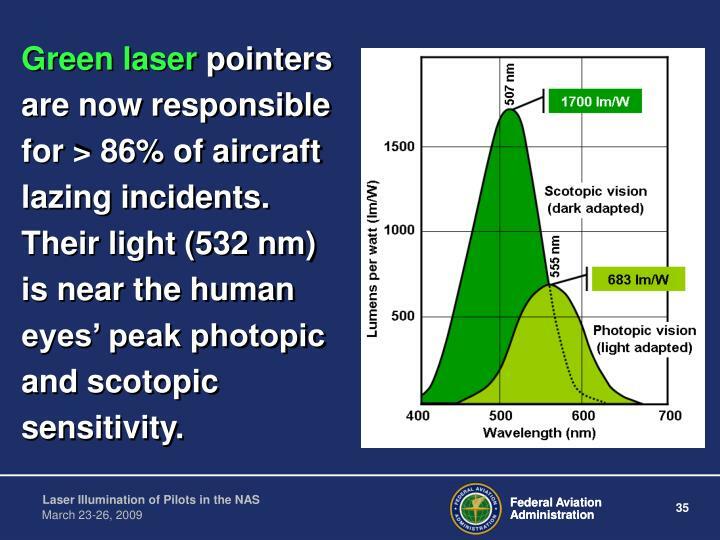 Their light (532 nm) is near the human eyes’ peak photopic and scotopic sensitivity. 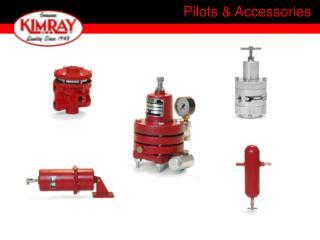 are available on the Internet. 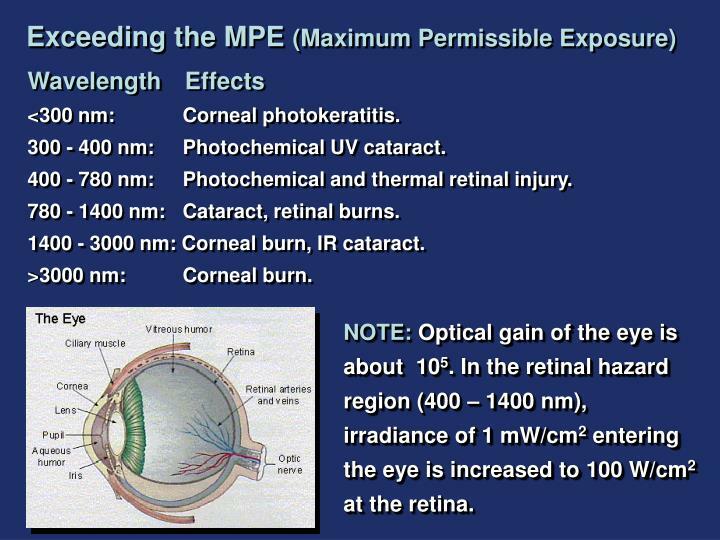 Within the NOHD, momentary exposure (≤ 0.25 s) can cause eye damage. 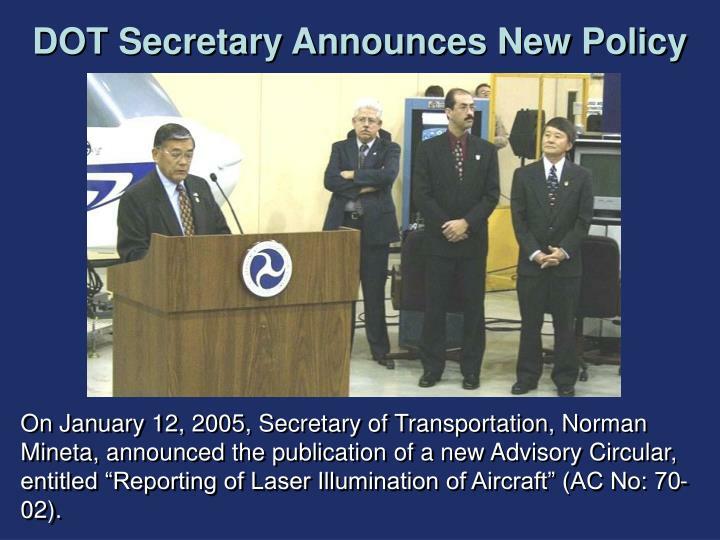 On January 12, 2005, Secretary of Transportation, Norman Mineta, announced the publication of a new Advisory Circular, entitled “Reporting of Laser Illumination of Aircraft” (AC No: 70-02). 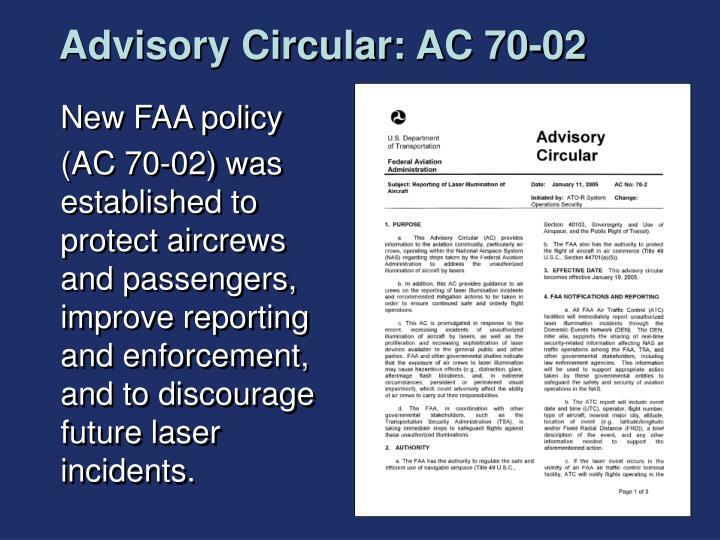 (AC 70-02) was established to protect aircrews and passengers, improve reporting and enforcement, and to discourage future laser incidents. Arrests of perpetrators have increased. 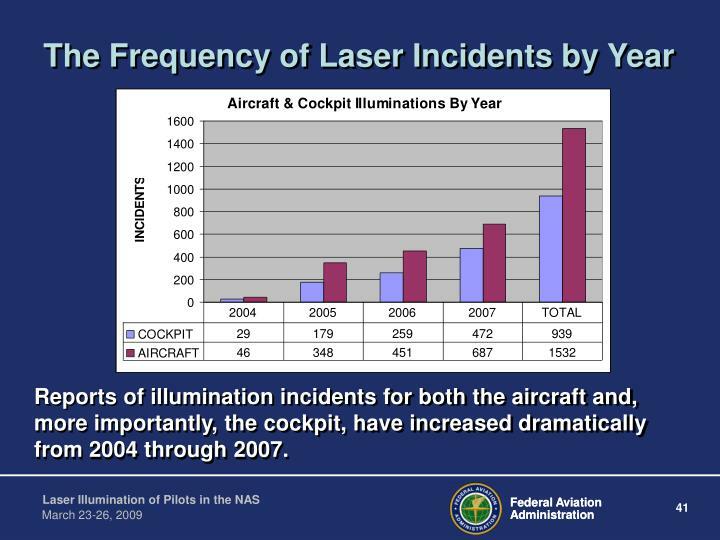 Reports of illumination incidents for both the aircraft and, more importantly, the cockpit, have increased dramatically from 2004 through 2007. 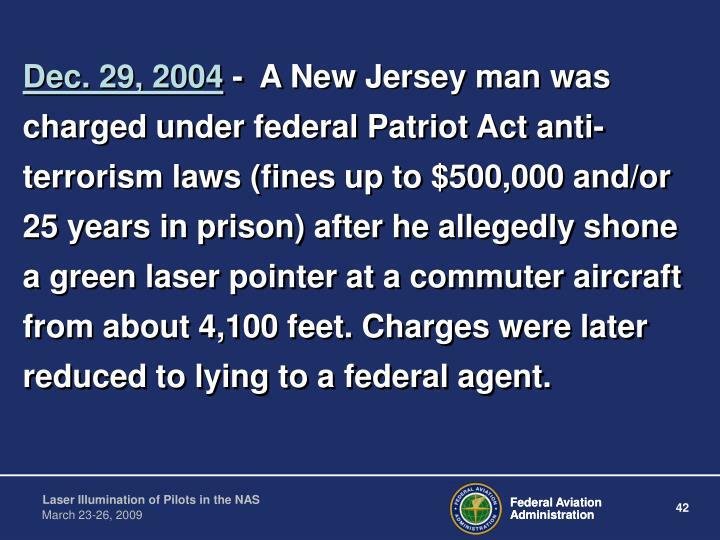 Dec. 29, 2004 - A New Jersey man was charged under federal Patriot Act anti-terrorism laws (fines up to $500,000 and/or 25 years in prison) after he allegedly shone a green laser pointer at a commuter aircraft from about 4,100 feet. Charges were later reduced to lying to a federal agent. 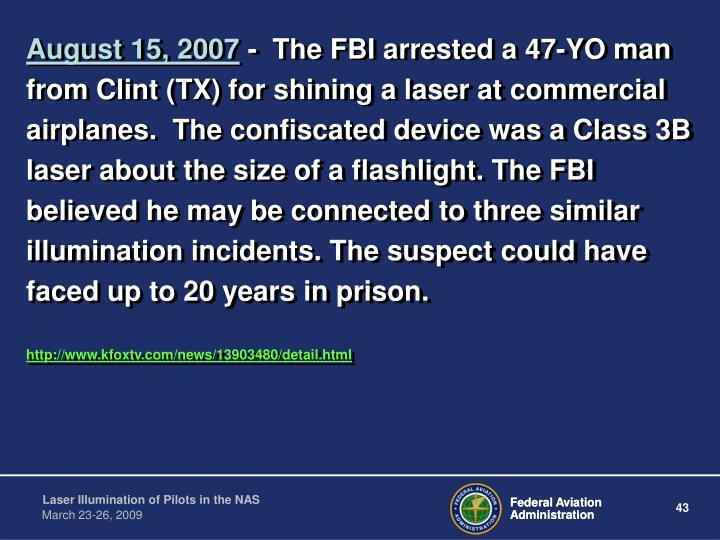 August 15, 2007 - The FBI arrested a 47-YO man from Clint (TX) for shining a laser at commercial airplanes. 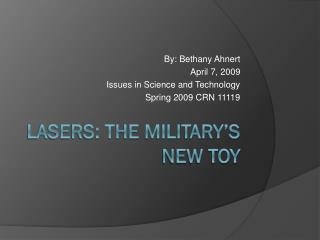 The confiscated device was a Class 3B laser about the size of a flashlight. The FBI believed he may be connected to three similar illumination incidents. The suspect could have faced up to 20 years in prison. 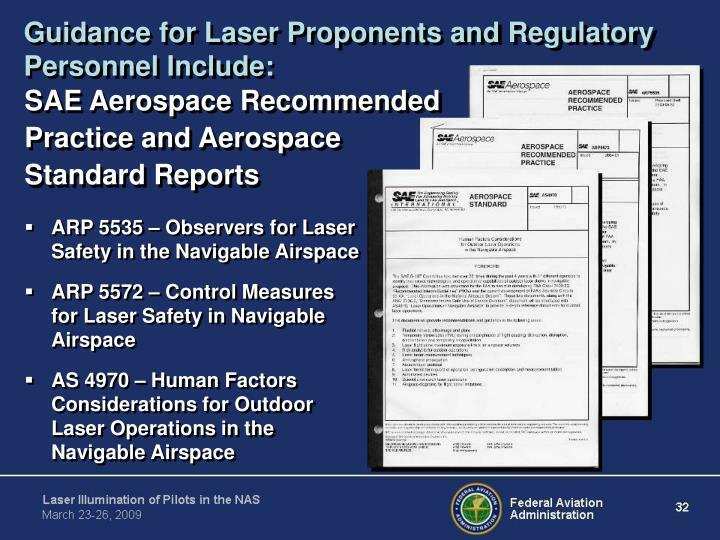 June 4, 2008 - A 24-YO man was charged with four counts of discharging a laser and causing the pilots to be temporary visual impaired or disoriented. 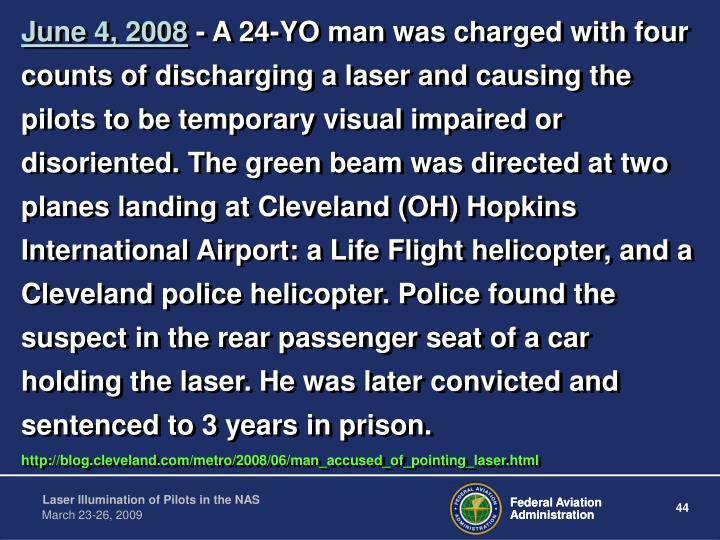 The green beam was directed at two planes landing at Cleveland (OH) Hopkins International Airport: a Life Flight helicopter, and a Cleveland police helicopter. 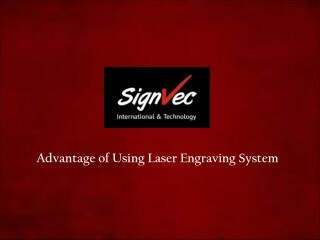 Police found the suspect in the rear passenger seat of a car holding the laser. He was later convicted and sentenced to 3 years in prison. 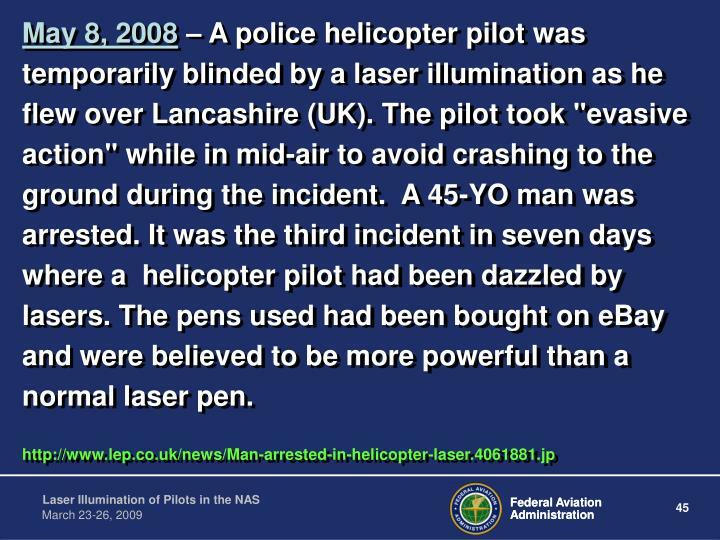 May 8, 2008 – A police helicopter pilot was temporarily blinded by a laser illumination as he flew over Lancashire (UK). 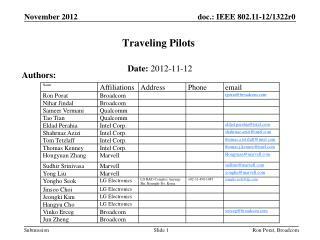 The pilot took "evasive action" while in mid-air to avoid crashing to the ground during the incident. A 45-YO man was arrested. 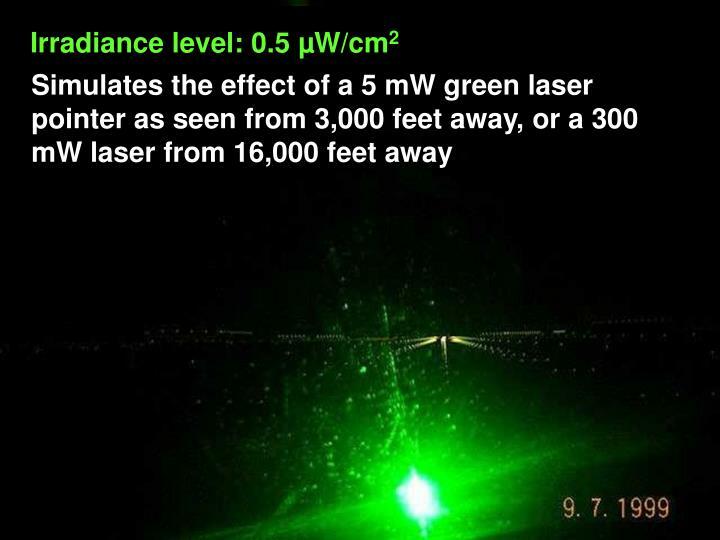 It was the third incident in seven days where a helicopter pilot had been dazzled by lasers. 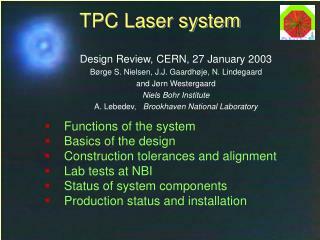 The pens used had been bought on eBay and were believed to be more powerful than a normal laser pen. 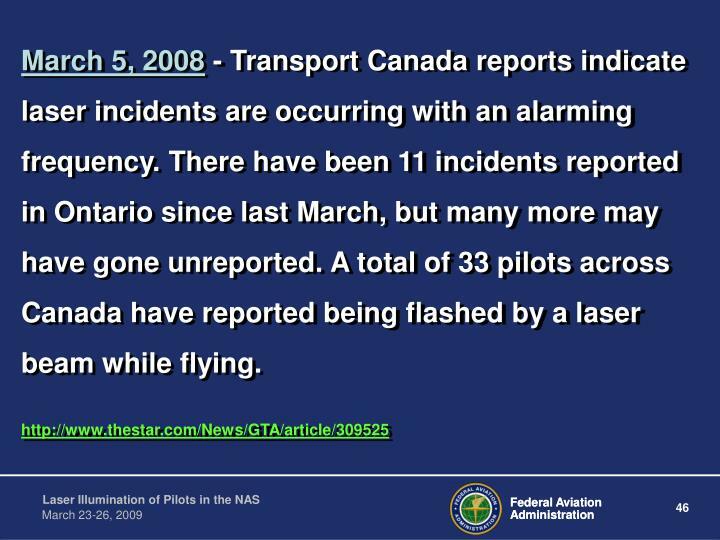 March 5, 2008 - Transport Canada reports indicate laser incidents are occurring with an alarming frequency. There have been 11 incidents reported in Ontario since last March, but many more may have gone unreported. 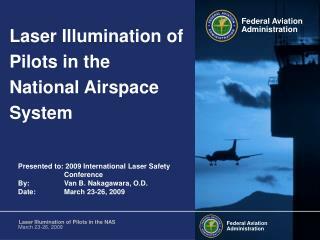 A total of 33 pilots across Canada have reported being flashed by a laser beam while flying. 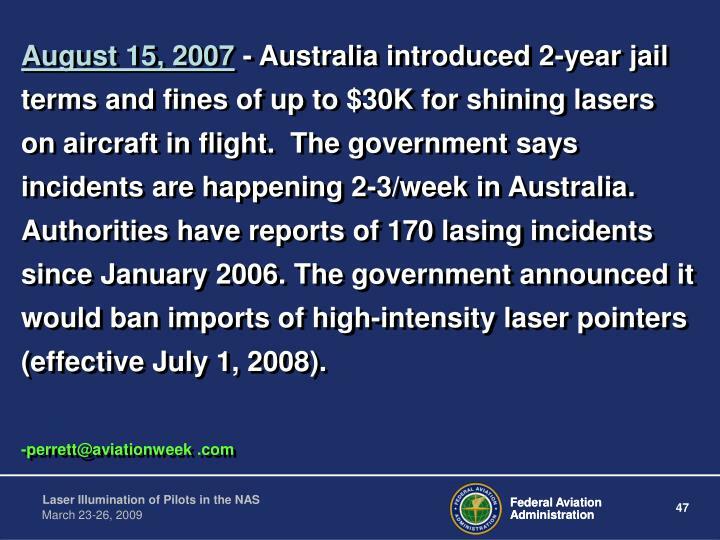 August 15, 2007 - Australia introduced 2-year jail terms and fines of up to $30K for shining lasers on aircraft in flight. The government says incidents are happening 2-3/week in Australia. Authorities have reports of 170 lasing incidents since January 2006. 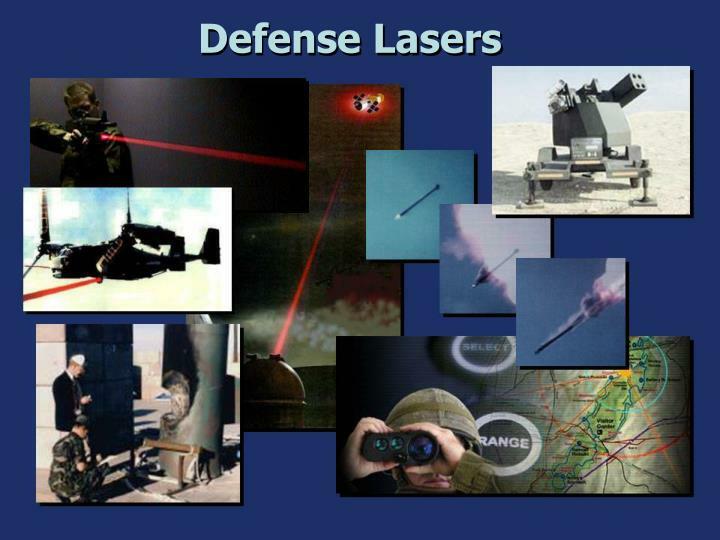 The government announced it would ban imports of high-intensity laser pointers (effective July 1, 2008). 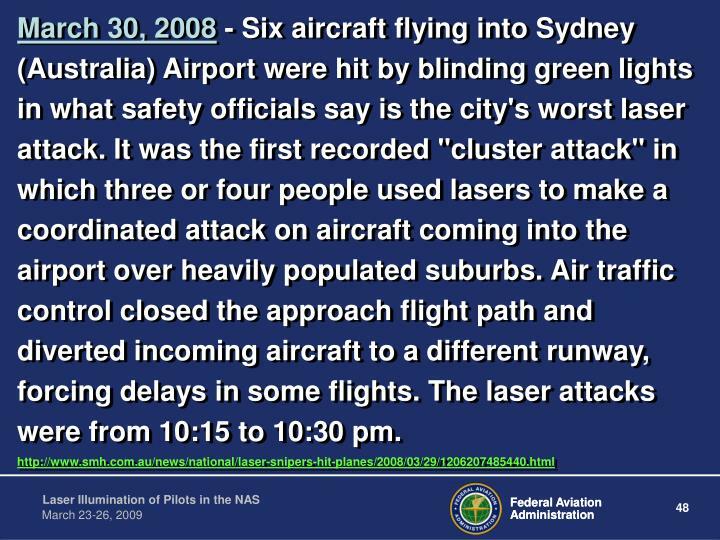 March 30, 2008 - Six aircraft flying into Sydney (Australia) Airport were hit by blinding green lights in what safety officials say is the city's worst laser attack. It was the first recorded "cluster attack" in which three or four people used lasers to make a coordinated attack on aircraft coming into the airport over heavily populated suburbs. 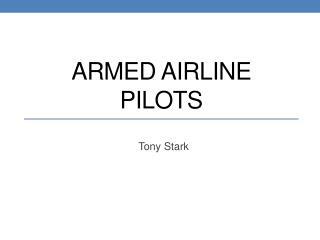 Air traffic control closed the approach flight path and diverted incoming aircraft to a different runway, forcing delays in some flights. 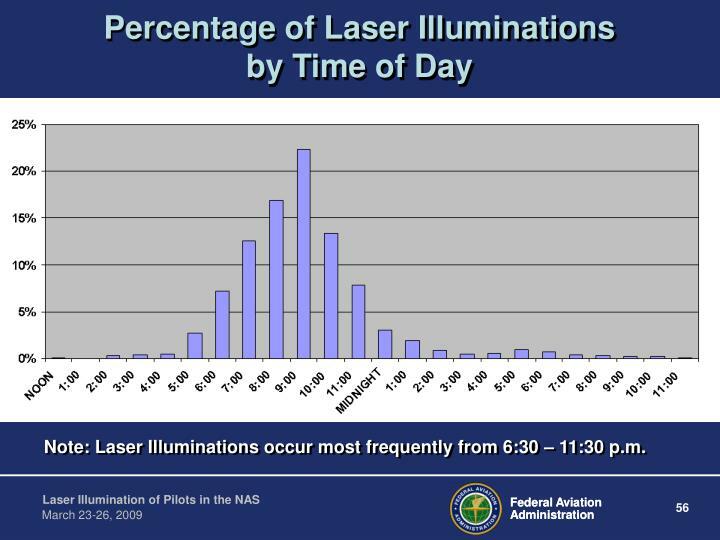 The laser attacks were from 10:15 to 10:30 pm. 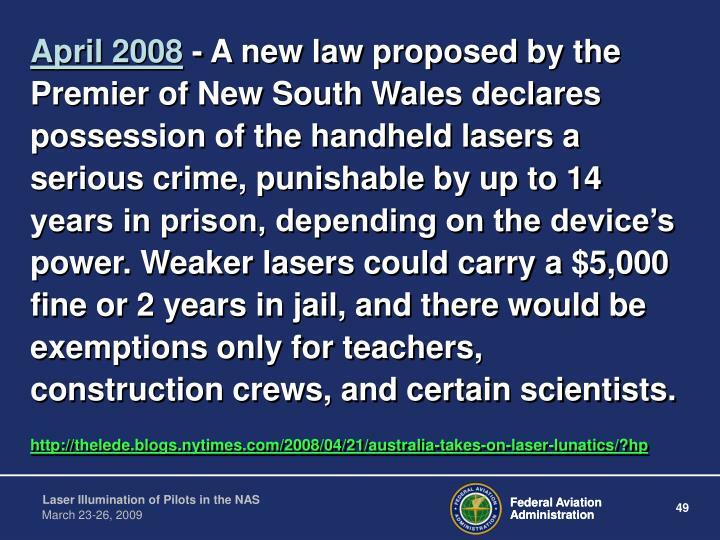 April 2008 - A new law proposed by the Premier of New South Wales declares possession of the handheld lasers a serious crime, punishable by up to 14 years in prison, depending on the device’s power. 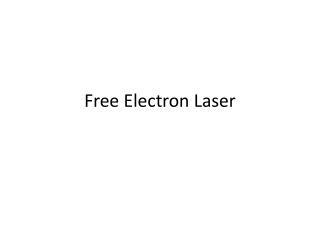 Weaker lasers could carry a $5,000 fine or 2 years in jail, and there would be exemptions only for teachers, construction crews, and certain scientists. 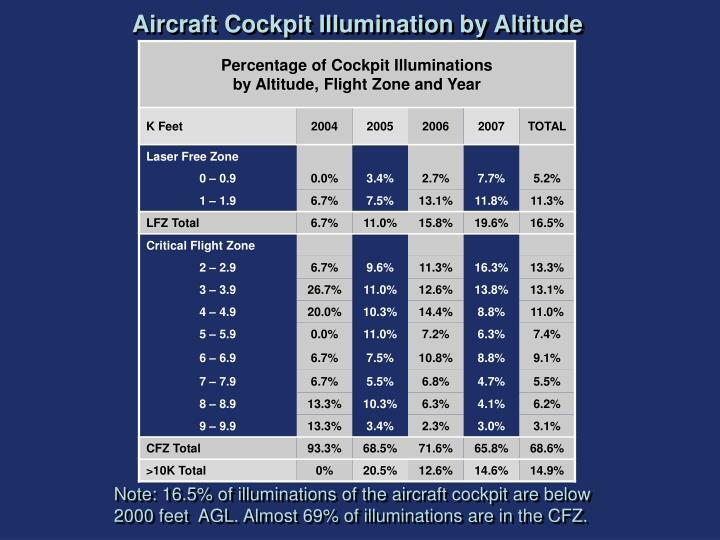 Note: 16.5% of illuminations of the aircraft cockpit are below 2000 feet AGL. Almost 69% of illuminations are in the CFZ. 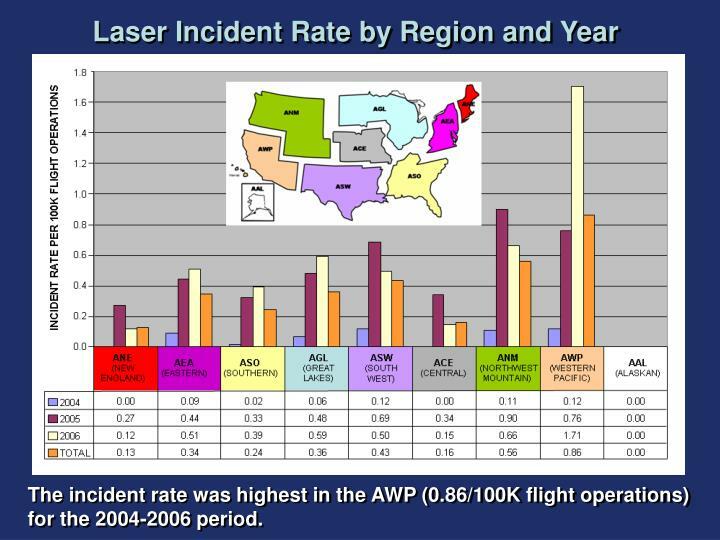 The incident rate was highest in the AWP (0.86/100K flight operations) for the 2004-2006 period. 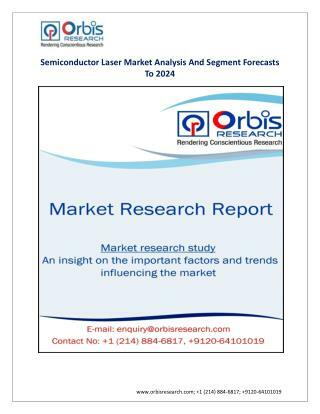 By region, the percentage of traffic volume is disproportionate to the rate of illuminations. 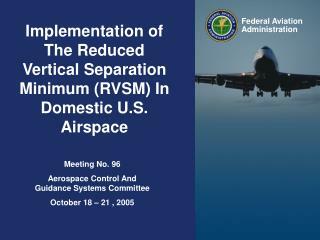 Note: The Western Pacific region’s incident rate was 3.6 times higher than that of the Southern region (0.86 and 0.24/100K flight operations, respectively) although both had similar traffic volumes (22 and 21%, respectively). 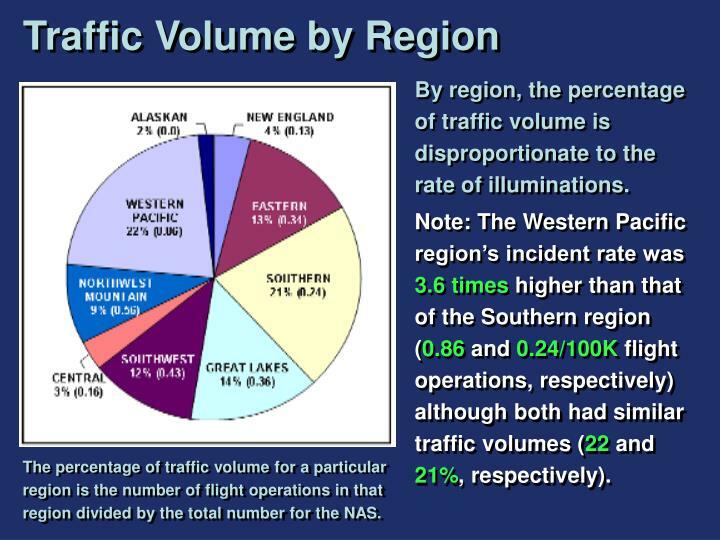 The percentage of traffic volume for a particular region is the number of flight operations in that region divided by the total number for the NAS. 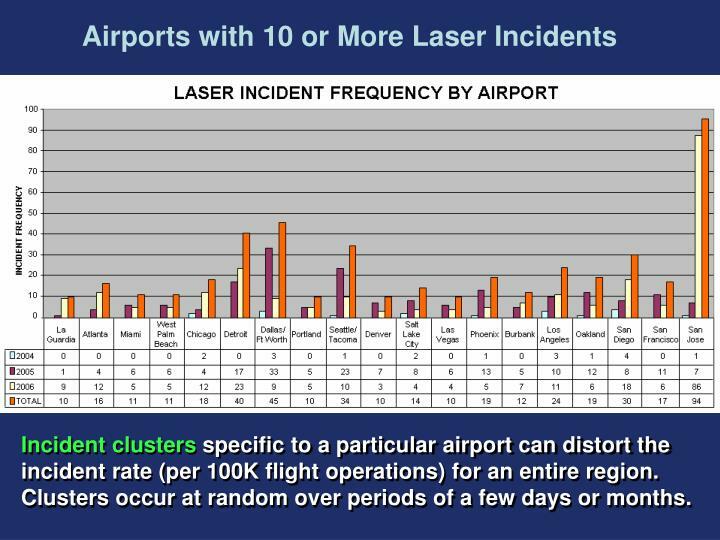 Incident clusters specific to a particular airport can distort the incident rate (per 100K flight operations) for an entire region. Clusters occur at random over periods of a few days or months. 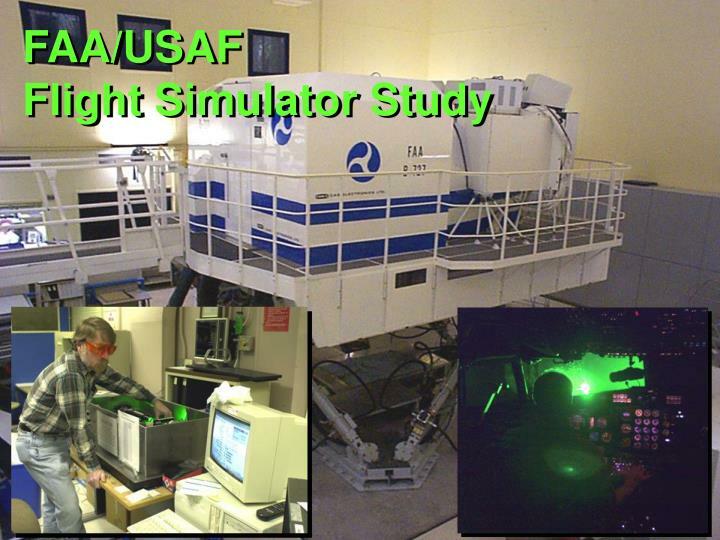 Of 746 cockpit illuminations where altitude was provided, 8.6% described one or more adverse effects (2004-2007). 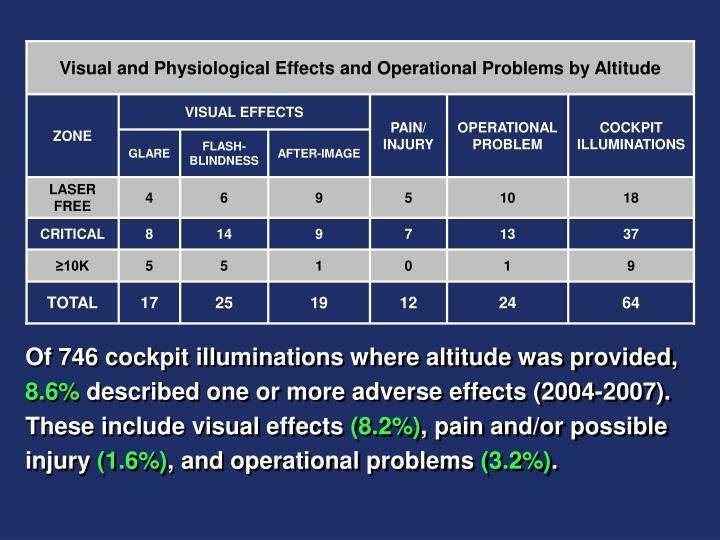 These include visual effects (8.2%), pain and/or possible injury (1.6%), and operational problems (3.2%). 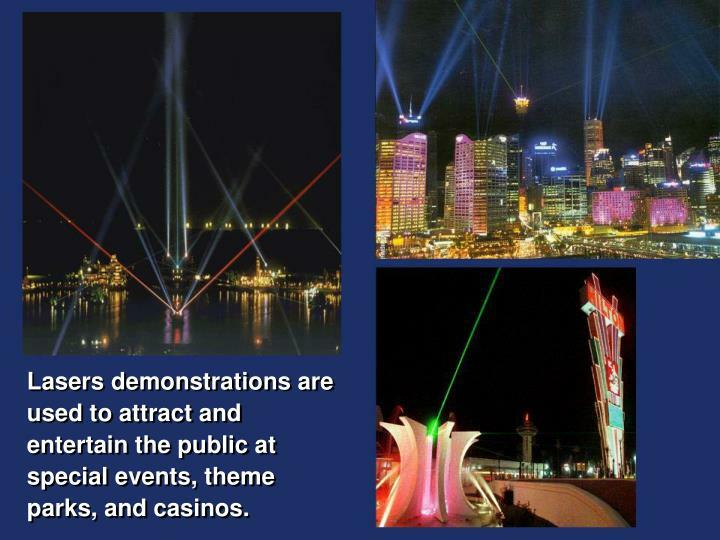 Laser Illuminations occur most frequently in November, December, and February, and least frequently in May, June, and July. 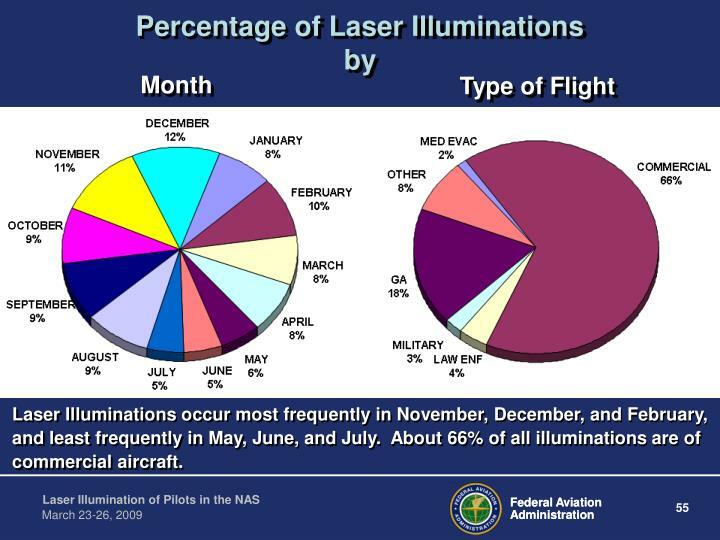 About 66% of all illuminations are of commercial aircraft. 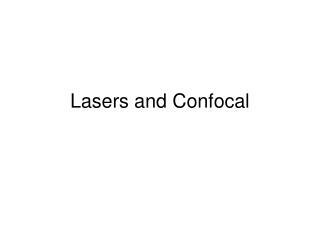 Note: Laser Illuminations occur most frequently from 6:30 – 11:30 p.m. 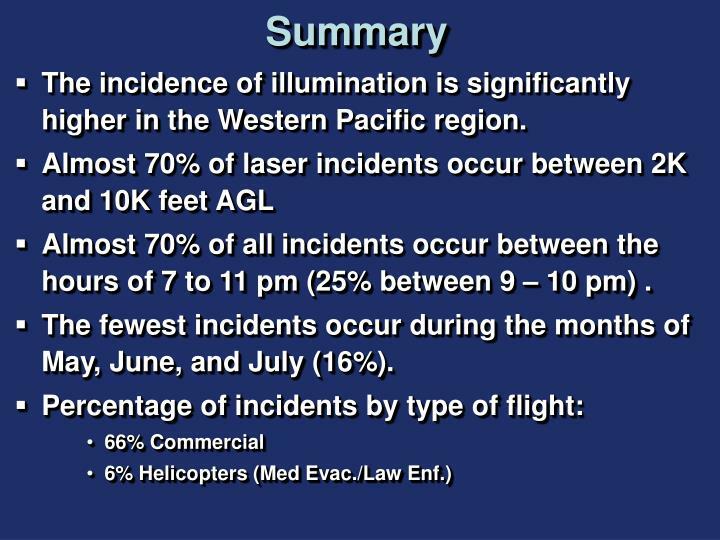 The incidence of illumination is significantly higher in the Western Pacific region. 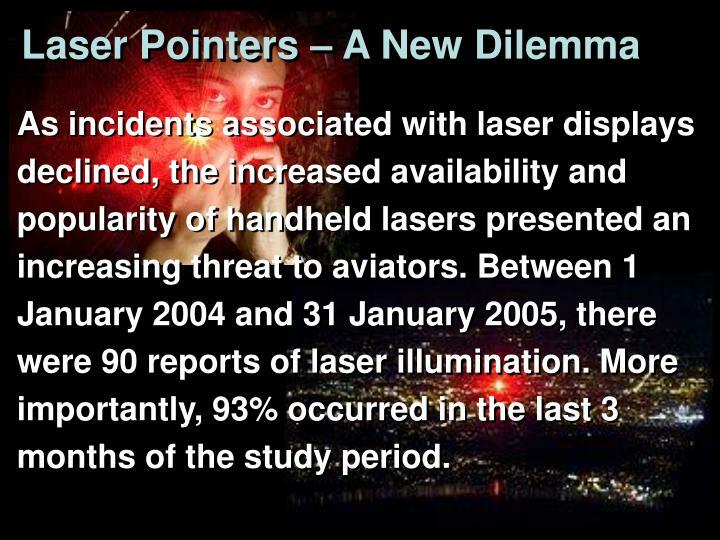 Almost 70% of all incidents occur between the hours of 7 to 11 pm (25% between 9 – 10 pm) . 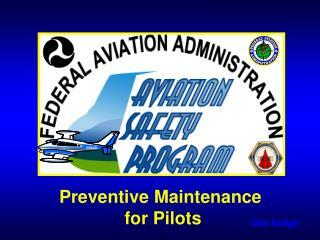 The fewest incidents occur during the months of May, June, and July (16%). 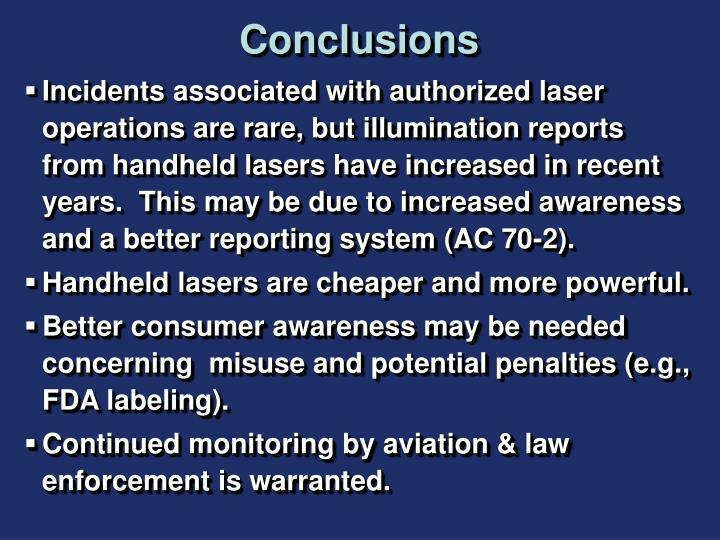 Incidents associated with authorized laser operations are rare, but illumination reports from handheld lasers have increased in recent years. 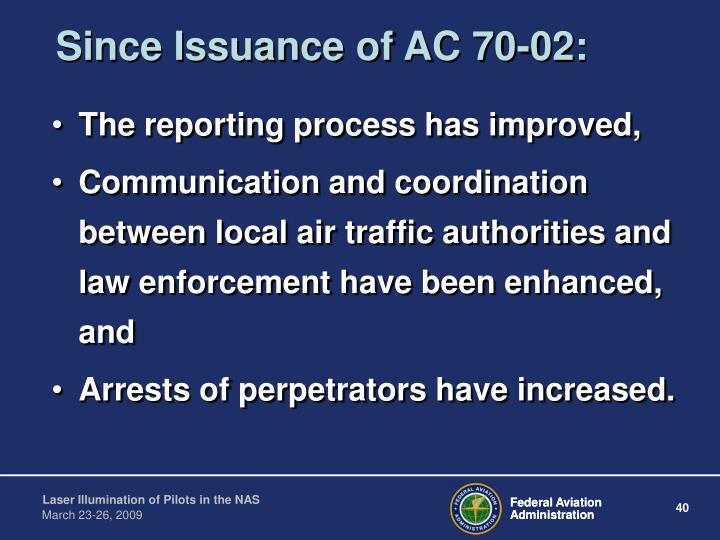 This may be due to increased awareness and a better reporting system (AC 70-2). 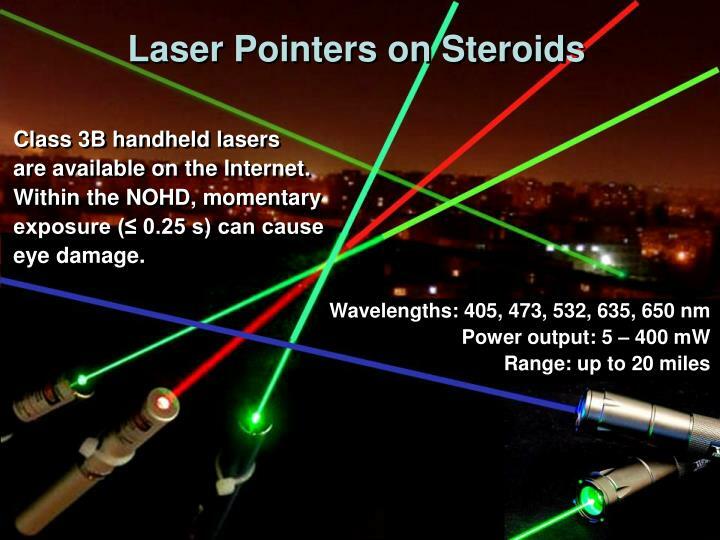 Handheld lasers are cheaper and more powerful. Better consumer awareness may be needed concerning misuse and potential penalties (e.g., FDA labeling). 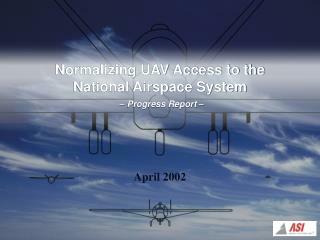 Continued monitoring by aviation & law enforcement is warranted. 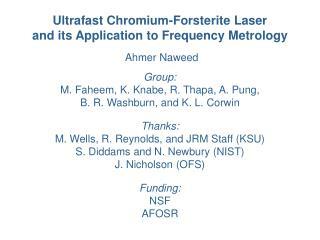 Ti:sapphire Laser -Ultrafast chromium-forsterite laser and its application to frequency metrology ahmer naweed group: m. faheem, k. knabe, r. thapa, a. pung, b. r. washburn, and k. l. corwin thanks: m. wells, r. reynolds, and jrm staff (ksu) s.
Airports, Airspace & ATC -Airports, airspace &amp; atc. runway &amp; taxi markings. 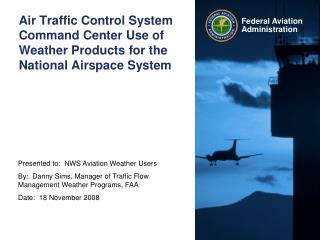 what color are all runway markings?. 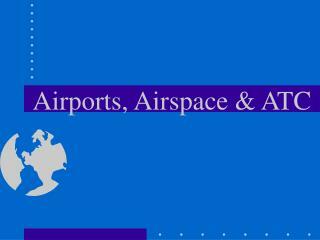 runway &amp; taxi markings. 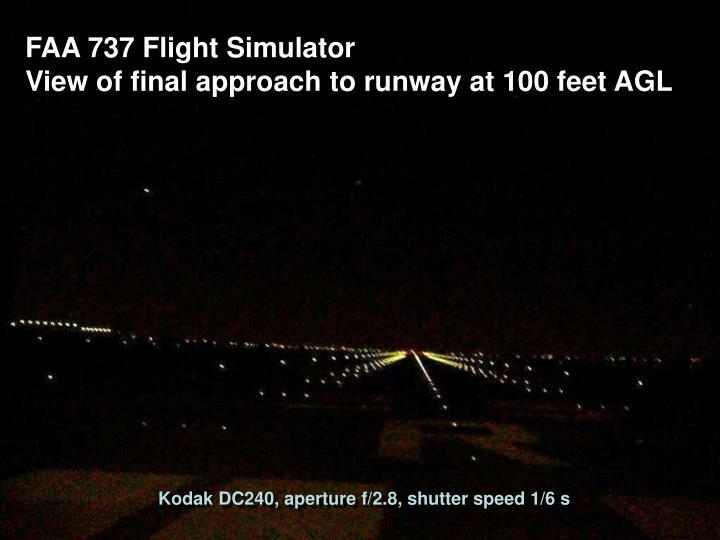 what color are all runway markings? white. runway &amp; taxi markings.